CRE 2019 will, of course, include the possibility of joining the conference dinner that will be held at Restaurante “La Casa Vieja”. 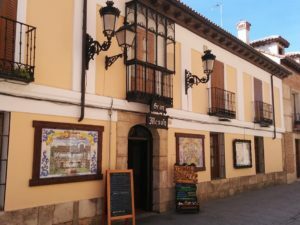 “La Casa Vieja” is one of the best known restaurants in the city, located in a traditional Castilian house. The price of the dinner will be 30€ per person. – Starters: a wide selection of Spanish traditional “tapas” (paella, gazpacho soup, cheese, serrano ham…). – First course: a main dish to choose between meat (grilled beef steak), fish (codfish, hake or sea bream) or vegan/vegetarian (grilled vegetables). – Dessert: a selection of Alcalá traditional patisserie. In order to facilitate the organization of the conference dinner, we kindly ask all participants to choose their preference of menu when completing their registration form. Please, let us know if you have any special dietary requirement or allergy beyond the options offered in the registration form.